If you own or operate an online store, or if you accept any kind of payments via your website, protecting your customers’ privacy should be a top priority. After all, as a webmaster it’s your responsibility to ensure that your visitors’ valuable information isn’t exposed to any ill-intentioned individuals or entities on the Internet. But with all of the vulnerabilities in today’s technology, what’s the best way to keep your shoppers’ secrets safe? The esoteric term Secure Sockets Layer (SSL) might not mean much to you now, but it’s this element of the Internet’s engineering that allows online transactions to transpire in a safe manner. And while you don’t need to know precisely what “sockets” are in this context, it is important that you have at least a cursory understanding of how this technology works and how it might affect you and your business. What Is SSL Hosting and How Does It Work? SSL hosting is a fundamental element of Internet technology that’s responsible for encrypting information transmitted between Web servers and Web browsers. 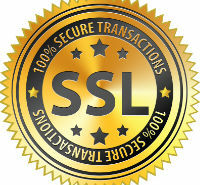 Millions of websites utilize SSL technology to provide their customers with peace of mind while shopping on their site. By disguising sensitive data as digital gobbledygook, SSL guarantees that evildoers on the Internet can’t access or manipulate any information they’re attempting to intercept. Simply stated, SSL web hosting creates a closed line of communication between a computer and a server. When you enter the Web address of a secure site into your browser, the server on the receiving end replies to your computer to discern whether you’re connected via a trusted link. Industry insiders commonly call this an SSL handshake, and if a safe connection is confirmed, any sensitive data is instantly encrypted and securely transferred from end to end. If you’ve ever wondered whether an online transaction you’re engaged in is taking place via a secure connection, there’s a super-simple way to find out. Near the top of your Web browser, you’ll see an area that contains the uniform resource locator (URL), aka “address,” of the site you’re visiting. All website URLs begin with “http://”, though if the site you’re on is secure, the URL will start with “https://”. And although it’s not critical for you to know what each of those letters represents, it’s easy to remember that the “s” stands for secure. So when you see that “s,” you can rest assured that you’re connected to an SSL host and that you’re in good hands. Depending upon which Web browser you use, you might also see a green-colored padlock icon in the address bar, making it even easier to tell when you’re conducting business over a trustworthy connection. If don’t see that “s,” or a little green padlock, you might want to think twice about sharing your information with that particular website. When it comes to Web hosting, SSL is a must for any individual or business interested in selling things online. Many of the top hosts featured on our site offer great plans that can ensure secure connections transactions with your customers. In fact, it’s even possible to get free SSL Web hosting for your site. Now that you know how to make your website a safer place for shoppers, find the host that’s best for you. Are you ready to start protecting your website visitors with top of the line security? Sign up for an SSL hosting package and you’ll be in business like never before.